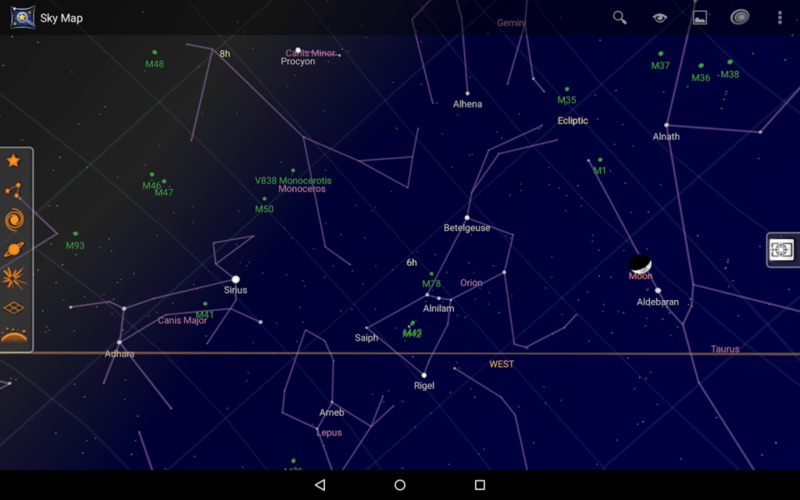 Neat Sky Viewer – See Constellations. nighttime sky still presents an inspiring spectacle. curious, "Skyscape" is a convenient tool for extending your knowledge. appear to you at the chosen location and time. year, Skyscape allows you to enter the month and day. are alike in being the largest celestial objects visible from Earth. of the equator. Negative values indicate a southerly location. degrees from the northern or southern horizon at noon. to the east of smaller ones. what stars and constellations would be visible at that time. - Moon's age. The number of days since the last new moon. east or west of the sun. also shows the distance of each planet from Earth in millions of miles. line 130 of SKYSCAPE.BAS from ES = 93 to ES = 149.6.
time in the current day. indicates a position directly overhead. At the bottom of the sky you may see two-letter abbreviations. from the position of its abbreviation. Daytime skies are shown in blue and nighttime skies in black. an hour of twilight before sunrise and after sunset. astronomy lessons and planetarium displays. cities in the United States which may be used in Skyscape.